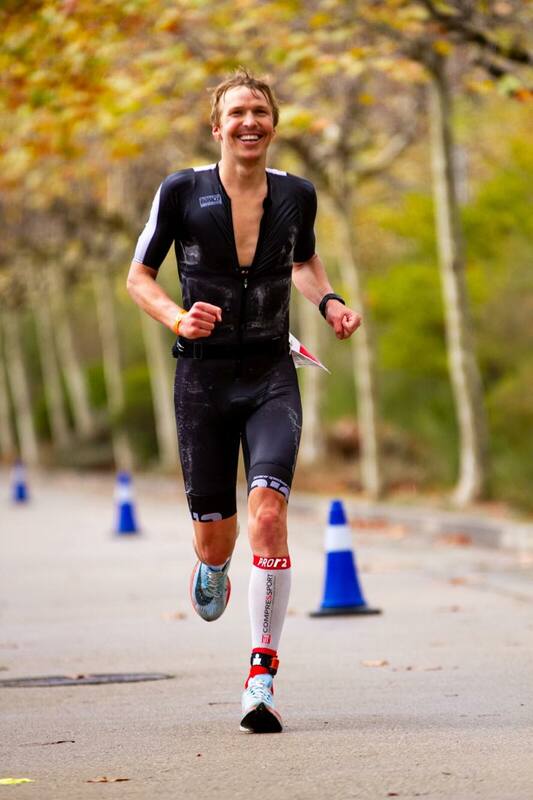 Like mentioned in my previous blog post “Ready for Ironman Barcelona”, I had a steady performance decline the last races, despite being in better shape (FTP, CCS and run speed) and training more and harder than ever. That was frustrating for sure and with a race schedule that was too hard I lacked the energy and motivation to dig deep in races. I was pushing myself way too hard and had IM Barcelona in 2017 as the definitive answer that this was the case. 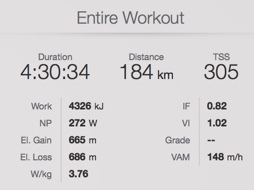 I started the bike with 240 – 250 watts and it felt hard, and after 100km with that, I was done going down to below 200-ish watts the rest of the bike. The run was the worst ever with a marathon time of 3:29. It was a truly horrible experience. It was also the catalyst for change. After teaming up coach Carson Christen and getting a better training/rest balance things really turned around. Most importantly, I was looking forward to race in Ironman Barcelona, like I have done all season. The Norwegian IM-record was mine to take. The sea was rather rough with big waves coming in from the South-West. I have made steady progress in the pool the last two years, but swimming outside is different, especially in rough conditions. 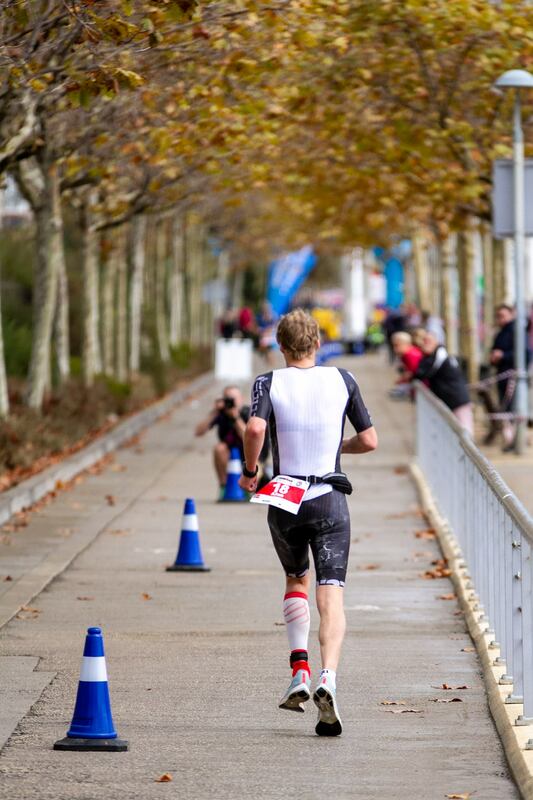 I knew from IM 70.3 Marbella that I am relatively weaker swimming in waves coming in front compared to others, and I have not been able to train those skills since. The conditions were definitely not in my favour. I tried my best and went out as hard as I could without ruining my ability for a steady hard swim afterwards. There were arms and feet everywhere in the white and wavy water, but I kept calm knowing that it would calm down after the first 200m at the first buoy where we turned right. After that, we settled into a more stable group with a steadier pace. The only problem was that it was not the group I hoped to be in and the pace was not as high as I wanted. I estimated that the group ahead was 20-25 meters in front. It does not sound much, but that is nearly 20 sec. If I am going to gap 20 sec it means swimming 4 seconds faster for 500m, which is a huge effort. The rough water also makes it more difficult to swim really hard as it increases the risk of breathing in water with heavy breathing. I did not bother to try. When the second guy in the group lost the feet of the first guy, however, I pushed hard and closed the gap. His feet were decent, but he constantly swam to the right and we nearly stopped and turned hard left each buoy. I knew he did not swim straight and after a while, I dropped his feet and chose the fastest route. From then I was swimming in front for about 1000m before the same guy came up on my right side. I got his feet again and just kept them until the finish. I could have swum faster for sure, but a gain of only 15 sec would have given a huge increase in effort. Here you can see the conditions at the swim start. Ironman posted live on Facebook the whole race, which can be seen in this link. If you are wondering how you should swim in choppy conditions you can look at Guillem Rojas, who crushed everyone on the swim with a time of 45:34(!). It does not look very smooth, but this is the way to swim when things are getting rough. My goal was to race 110% until the end of T1. For that reason I sprinted thru the transition and jumped on my bike. To my surprise I saw no one from behind even if I knew I got out of the water with at least 5-6 others. I did not see anyone in front either. The bike course in Barcelona is going along the coast and you can see far ahead. I did not see anyone, not even the stretches I could see one minute of riding ahead. I could not believe it. A field of 61 starting male PROs and I was in no-mans land. I focused on what I could do, ride sustainably hard and as aero as possible. With no one in sight, there is no reason to go for a hard surge to catch someone either. It took 25 minutes before I saw a rider who was roughly one minute ahead. After 10 minutes I caught up but it was not a wheel worth being behind. Caught up with a few other guys but could see the big groups ahead of me in the turnaround. I was already nearly 10 minutes behind the first group (and more Jesper Svensson who rode solo in front). In the hill, I estimated the closest group was one minute in front. I was determined to catch them but 60 sec is more than it sounds, and I knew that doing a surge to catch them was not wise. Probably I must have done 20 minutes of above threshold power to catch them, never a good idea so early in the race. After riding at a more steady 280-290 watts for 30 minutes we got to the turnaround at Montgat and I could see that I had gained absolutely nothing. Not a second. My goal watt for the whole race was 260w so I was pushing harder than planned but did not make any ground. I was close to “giving up” the chase and go down to the planned watts. Pushing 20 – 30 watts higher than planned would cost me later, but worth it if I got a good group. Getting back to Calella for the turn around for the first lap I got a visual on the group ahead. Then I understood why they rode so fast as well. The 12m drafting rule looked more like 8m and bib nr. 19 had the most shameless wheel sucking I have seen in a pro field ever staying less than 3m behind with no plan of passing or dropping back. Fellow Norwegian Hans Christian who was in the field had a legit distance, but in my opinion, the others were way too close. With the referees no way to be seen it was only the moral compass preventing if you would from cheating. At that point, I had pushed 285 watts (4,2w/kg) on average for 2 hours and 15 minutes and estimate that some of the other would have done the same with 3w/kg. I stayed behind the group for roughly 30 sec before I hit the front and kept on pushing the same watts. The group hang on for a short while before fading back, like I was certain they would. If they had the strength I would not have bridged the big gap so quickly. From behind, I got a Irish guy passing me with high pace, Bryan McCrystal. Recalled the speaker announced him as an Überbiker before start . I caught his wheel but could see he did not enjoy it looking back and giving me “the look”. Clearly, he thought I was drafting. I did not agree but decided to not follow as he did his surge when going uphill. I had been riding alone for 115km and could just as well finish it that way. At that point, I had gotten my own follower staying (in my view) way too close to my wheel, but thought he could be valuable as a pace keeper if things got harder towards the end. He faded away at 160km. It was tough cycling the last 40 km having averaged 276 watts for 3,5 hours and with what felt like a headwind both going out against Barcelona and back again to Calella. 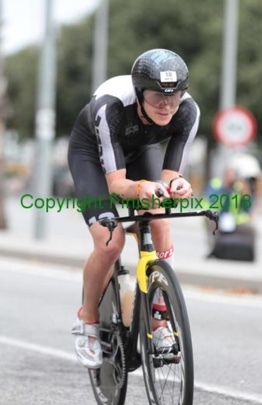 The fact that the bike course was roughly 2 km too long did not help and I came in to transition on 4:33, 6 minutes slower than last year despite averaging 40watt higher power, one of my very best bike performances ever. This is good numbers, and W/kg is actually slightly higher because I weight a few kilos less. I am not happy with the time I got with those numbers and believe I should go faster. Did I look up too much and losing aerodynamics? Maybe. I am very happy with my position comfort-wise, but how is the aerodynamics? In November I will go to the Boardman windtunnel and then we will get the data. Solo out of T1 and solo into T2. It was rain and heavy clouds coming into T2 and I left my visor and sunglasses in the bag. I was not caring a gram more than necessary. My coach summed up that my total run millage since July was 150km. I had only had two running sessions after Norseman that felt good. The starting pace should not be faster than 4:15m/km. I was way behind on my time goal of sub 8:26:20 and figured out I needed a 2:52 marathon to do it, nearly 8 min faster than my PR. 4:15 would not do. I started running with aiming for an effortless feeling. The first km went on 3:50(!). Then I backed of aiming for a slightly more effortless feeling. The pace was roughly 4:00m/km. I held the pace the first 10km, then the next 5. The 21 km was done in right under 1:24 and I still felt like a million dollar. If I held the pace until 28 km, I could go down to “only” 4:15m/km pace a hit 8:26. I held the pace until 28 km, getting ready for one last lap. Then I hit the wall. I thought 4:15m/km should be easy but I was doing 4:20, 4:25 and up to 4:30. Hitting the wall is rather common for most people. Me, however, rarely hit the wall, rather gradually fade. I then realized I had been screwing up my nutrition plan on the run. I aimed for 360kCal/h on the bike, which I held perfect and 260kCal/h on the run. I started with 5 Squeezy gels on the run and should eat one every 20 minutes from 10 minutes. My last gel should be consumed after 1:30 on the run and lasting 20 min after that. I had run for just over two hours and could not remember eating more than 4 gels, but since I did not find the fifth on I figured out I had just lost count. I found the gel, in my tri suit, after crossing the finish line. That meant I had just consumed 170kCal/h on the run, apparently not enough to maintain my energy needs with a 4:00m/km pace. The last lap of 14km I walked thru four of the aid stations drinking a big cup of coke. It was obviously too late for an optimal performance, but I felt it gave me a much-needed boost. The last lap was tough; especially my front thighs were starting to say that enough is enough. However, I did not get go into a “dark place” mentally. I knew the 8:26 was not possible, but every second I could gain would give me a better PR. I focused on the task. Saying to myself that I feel like a million dollar and are doing awesome. Running so much better than before with so little training was basically a little miracle. I counted steps to keep my mind busy. 50 steps on the right leg, 50 steps on the left leg. I was not overflowing with energy towards the end but increased the pace the last 500 meters and finished sprinting against myself and feeling happy. 8:28:25 was 2 minutes and 5 sec shy of my time goal, but I honestly did not mind. 15 place out of 61 starting PROs and less than 10 minutes from top 5 is my best performance in a fast Ironman field. With this performance in this course and conditions I know that 8:26 should not be my time goal, in the right race I should aim for 8:10. I am super happy with the result and experience. It showed that the focus on improving my swim definitely the correct priority and I have to work on keeping my swim technique in waves. It also showed that I could ride more than 270 watts in average, which I should be able to get considerably more speed from after a trip to the Boardman wind tunnel in November. The importance of having enough nutrition the whole race was also a good lesson to relearn as it has been years since I had hit the wall like I did. Running 4min/km for 28km also gave me confidence that I can run a sub 2:50 marathon, a time goal I always have been certain would be possible, but not close to actually perform. The season is not over yet and I am really looking forward to the build-up towards Patagonman 9. december where I will race against IM 70.3 superstar Mauricio Mendez, in a format that I find to be fairer, and more true to the Ironman soul. 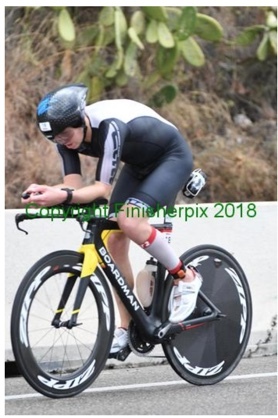 Posisjonen min er 2 cm høyere front enn den aller laveste mulige stillingen på Boardman TTE (og samme på Specialized Shiv Tri) i str. S. Den er egentlig ganske lav. Før hadde jeg den helt lavest og fikk veldig gode resultater i vindtunnelen, men satt den opp 2 cm etter en sykkeltilpasning for å få bedre «balanse» på sykkelen og mer bruk av bakside lår kontra fremside (der krampen som regel kom). Får ta en ny sjekk i vindtunnelen. Det blir en del testing nå frem mot vindtunnelen og jeg får noe veldig spennende utstyr som muliggjør en helt annen sittestilling. Mer om det kommer. Dette er en veldig imponerende prestasjon, gratulerer! Du skriver at gj snitt watt var 270. Jeg ser at NP var 272. Var gj snitt og NP nesten identiske? Jeg er enig med Mr Avdanka Ironman ang. din posisjon på sykkelen. Den ser relativt konservativ ut. Når det er sagt så er det jo ikke 40 K dette, men 180 K. Sikkert lurt med en aero test. Takk for svømmeklippet til spanjolen, det er noe av det mest imponerende jeg har sett. Gjennomsnittswatt var 266 for hele syklingen og 272 i NP. Neste Next post: The Vegan Triathlete?